Maturity in reptiles is primarily a function of size rather than age. An adult turtle is one that has grown large enough to mate and reproduce. Once most turtles have reached 70 percent of their maximum size, they are mature. The maturation rate of turtles varies greatly among species, as well as between genders and individuals. Most Fraser Island short-necked turtles (Emydura krefftii) from Australia reach maturity at about the same rate -- within about 6 to 10 years. The females reach 7 to 8 inches in length, while the males reach only 6 inches. Desert tortoises (Gopherus agassizi) reached maturity three years after hatching, according to a 1976 study by Crawford G. Jackson et al. published in “Herpetologica.” Scientists have studied box turtles (Terrapene sp.) extensively; though there are slight differences among populations, most reach maturity at around 10 years of age. The gigantic Galapagos tortoises (Geochelone nigra) take up to 40 years to reach maturity in the wild, but when living in captivity, they can achieve maturity by 25 years of age. The maturation rate of loggerhead sea turtles (Caretta caretta) varies greatly; some quick-growing individuals reach adulthood in as little as 12 years, while others take 30 years or more to reach 30 inches in length. Green sea turtles (Chelonia mydas) are among the slowest maturing species, taking up to 50 years to reach their mature size of 28 inches. 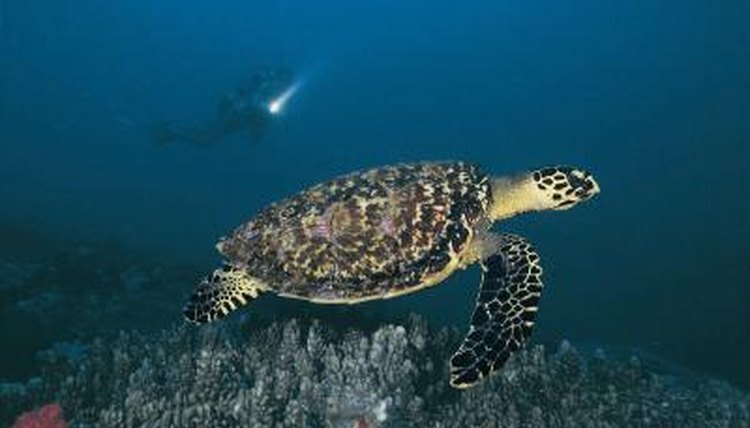 Hawksbill turtles (Eretmochelys imbricata) mature very quickly by turtle standards; they reach a carapace length of 24 to 36 inches in about three years. The slow biological clock of turtles influences their reproductive strategies. Upon maturation, most turtles stop allocating resources toward growth and start allocating them toward reproduction. Like most other animals who live long lives, turtles have low adult mortality and produce massive numbers of offspring, since juvenile mortality is high. As an extreme example, leatherback sea turtles (Dermochelys coriacea), the largest living turtle species, are capable of nesting up to 11 times in a season. As each nest contains about 80 eggs, each female adult turtle produces almost 900 eggs per year. Conservationists consider turtles to be the most imperiled vertebrates on the earth; nearly 30 percent of the living species are listed endangered or critically endangered by the IUCN Red List. Most scientists agree that native turtle populations cannot persist in areas where adults are harvested for food, pets or medicine. This is a particular concern for Asian turtles, which are often harvested for purported medicinal values. On one occasion, conservationist Brian D. Horne of the Wildlife Conservation Society observed 100,000 turtles being butchered for consumption in a Bangaldesh market. When humans remove adult turtles from the breeding pool, it takes a long time for juveniles to mature and take their place. In some species, it may be too late to help; scientists believe the population of Yangtze giant softshell turtles (Rafetus swinhoei) consists of only four individuals.